I'm sure all of you have heard by now about the scandal (and it is scandalous) regarding Ellen Hopkins and the Teen Lit Festival in Texas. If you haven't, check out School Library Journal's article here. Basically a librarian questioned the appearance and the author's suitability for her students and the festival un-invited her. In response, many of the other authors appearing have pulled out of the festival. Censorship is unacceptable and they are right to refuse to support any body, in this case the Humble School Distric, that would allow it. It's the responsibility of parents to monitor what their children have access to, not librarians or teachers or anyone else. If you don't want your teenager reading a certain book, then it's up to you as a parent to enforce that. 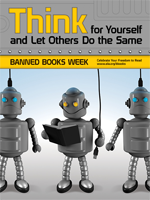 It is not a decision that should be made by anyone else (hence the "Think for yourself and let others do the same" slogan for Banned Books Week this year). Still I couldn't help but think of the upcoming festivals I'm going to (Decatur Book Festival in two weeks, National Book Festival in September, and Southern Festival of Books in October). If something like this were to happen at one of them and the other authors pulled out I would be devastated. I would understand their decision and support their stand, but I have to say I would be so disappointed to miss out on the opportunity to hear them and meet them and get my books signed. The selfish part of me would feel like I as a fan was being punished for a bad decision made by the festival hosts. The bad publicity being generated by the press coverage and the statement being made (that censorship will not be tolerated) is surely good for the cause. And while I think their decision is the right one to make,I feel for the teen readers (and adult readers) who are disappointed to hear that those they were excited to see won't be there. I would also love to see all of the authors show up at the festival and use their time as an opportunity to denounce censorship to those in attendance. Wouldn't that be something to hear? I'm sure there are reasons that are much better thought out for why this isn't possible. But I still want to hear it. The good news for me is that these authors aren't just pulling out of the festival - they are making a statement through their blogs. Take some time to read them and Ellen Hopkins herself on this issue. And if you've blogged about it, I'd love to link to your post as well. Leave a comment or drop me an email! It's things like this that really make me want to move. Luckily, I don't live in Humble, but Texas seems to regularly make book news around the country. Very disappointing. I actually stand with the authors that pulled out of the event. While I feel bad for the people that looked forward to the event, poor judgment should have consequences. It makes a much bigger statement to pull out of the event and I think will cause enough uproar for people to stand up against the school board. If the event just went on as normal (sans banned writer), there would be less uproar and thus, people would continue to feel like they could still make money off of events despite promoting things like censorship. hey not on topic of books and censorship but more about blogging and about honesty... check out this drama from yesterday..
she said she liked one bar better than another.. both small businesses and a lot ofpeople ripped on her for being too honest.. good lord.. opinions people opinions! That was insane. I feel so bad for the girl - I had to go back and read her review several times to figure out what people were upset about. Part of me, after all the drama this week, wants to repost my original review of the book. There was all kinds of further drama that went on after my post, but I feel like the right thing to do is honor what I originally told the company. It does make me feel like I need to post a really bad review now, just to show people I'm not biased. But I'm enjoying everything I'm reading right now! speaking of the blogger, i read today's post and was like hmm i wonder what she wrote and had to re-read like 3 times and was like wow people get a life. Wow, I read that blog post that pinkflipflops linked to...harsh. But I will admit that I review restaurants, bars, and concerts freelance, and people sat harsh things *all* the time. It's like they're personally offended that I didn't like the place, and they say that I'm wrong. Uhm...it's an opinion. By definition, it can't be wrong. And I always try to mention something positive, but they never seem to notice that. That's such a good question, Heather! I have no idea what I would do if an author I wanted really wanted to see was still appearing. I would want to support Hopkins and take a stand against censorship, but I would also really want to see the authors. It would be even harder for a conference like DBF or NBF where I've already paid to get a hotel room and have plans to go with other people. I don't know - selfish Julie really wants to meet those authors, you know? What would you do? I'm not sure either. I've been thinking about it a lot. I think if it was one that was just nearby, I would probably not go. But if it was a DBF situation, I would go, since I already had a plane ticket, hotel room, etc. But I know that part of me wouldn't really feel right about it. Would I really want to support a gathering that allows something like that to happen? But at the same time, in this case, the majority of the organizes are on Hopkins' side. It's such a hard situation.